Another busy week in the sun, well mostly sun and warm, ideal for hoeing off the weeds and dying in a few minutes, one of my favourite jobs is hoeing, that feeling of going though the bed, in a smooth calm action, with the sun on your back, only thing that beats it, is of course, hoeing a bed full of scented roses, total bliss! Anyway I am writing this on Friday evening, excited like a excited thing that is indeed very excited, why you may ask, well I am off to The RHS flower show at chelsea, all thanks to those great people at Griffin Glasshouses, who ran a competition for a couple of tickets on Saturday and my name came out! It’s made my week! I have only been once and that was many many years ago. I am sooo excited I could crush a grape! Geranium Orkney Pink, how stunning is that! Penstemon artic Fox is one of my favourite white penstemons and it works so well as white foil to many plants, great form indeed. I agree, geraniums are great plants. I didn’t know renardii but now I need to seek that one. I must buy one of those Orkney Cherry geranium plants. I saw one in a Six-on-Saturday last week, too. I would also like a white penstemon. However, some of my plants I have had for years are looking sorry for themselves just now so I had better nurse them back to health before I buy too many more…there again..? Wonderful rose this Louis XIV! Perhaps an inappropriate name for a rose because King Louis XIV was also named the Sun King, which would recall the yellow color … (?). Otherwise I’m still waiting for my Allium aflatunense, a bit late compared to A. Christophii, already in bloom here. Enjoy your weekend at the (fantastic, yes it must be !) RHS Flower Show and maybe the next SoS will be about it .. Your Louis XIV rose is a stunner, and the petals look like velvet in the photo. Beautful! Your Louis XIV rose almost convinced me to reconsider growing roses and try this one! Cheers. I really like your penstemon, and I love even more how easy they are to propagate! 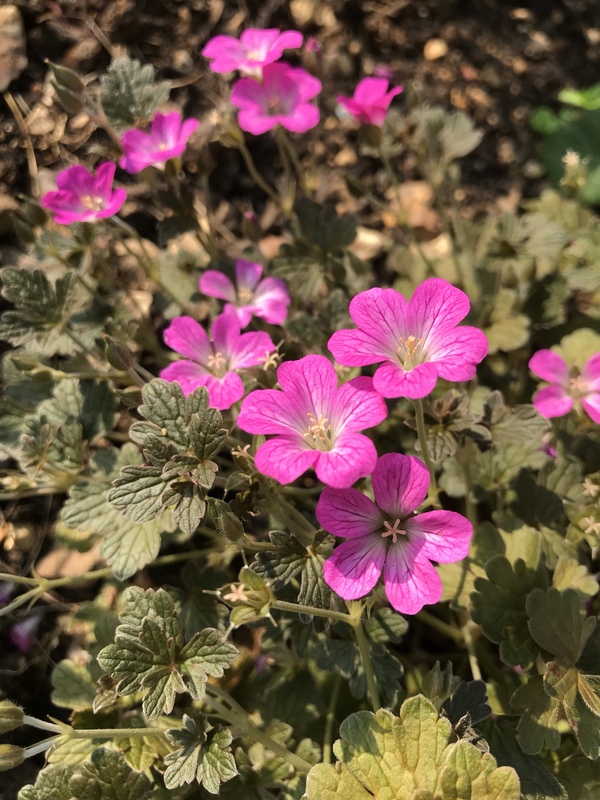 I’m a fan of your species geranium – don’t be shy, show me more! I bought a geranium renardii last month, like you say lovely leaves. No flowers on mine yet though, but sure it will reappear in my six when it does. Wow that Geranium Renardii is a corker! Must look out got that. Hope you had fun at Chelsea! This has definitely been the year when I have rediscovered a love of geraniums too. You have some interesting varieties there. Hope you had a great time at Chelsea. Your six has so many great plant ideas me to steal! Renardii looks wonderful, the penstemon is perfect – none of mine are in flower yet and that Rose has a sumptuous colour. Also a great idea to have two varieties of alllium to keep the colour going. My purple sensation have just finished and the border looks a little flat. Thank you for the inspiration. Snowdrops, tulips, and now alliums. I am really missing out on all these bulbs. I have seen alliums in catalogues, but never grown them. When I do, I want one that will survive to bloom again the following year. That is why I do not grow tulips. That is what I continue to be told, but there are not many bulbs that do well with a lack of adequate chill. I do apologise old fruit, I am sorry I have got such good taste, I shall try not to keep on making a habit of it, I went to Chelsea and didn’t buy any….. saw loads I liked……… so please avoid my new post…….. just need to find 6 for next week. Good news about the repeat flowering, mine are just starting to flower for the first time.